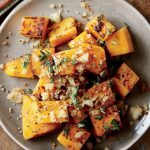 This 15 minute coconut walnut squash is fast, easy, and super healthy! A simple yet flavorful recipe that's perfect for a weeknight side dish. Melt coconut oil in a skillet over medium heat. Stir squash, tomato, walnuts, and garlic into coconut oil; cook and stir until heated through, 3 to 5 minutes.